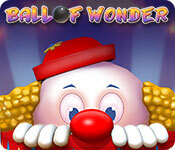 Ball of Wonder is rated 3.0 out of 5 by 9. Rated 5 out of 5 by thedoctor85 from That's cool I love this game. The levels are heavy enough (dark levels, oh my....), the arts are cute. 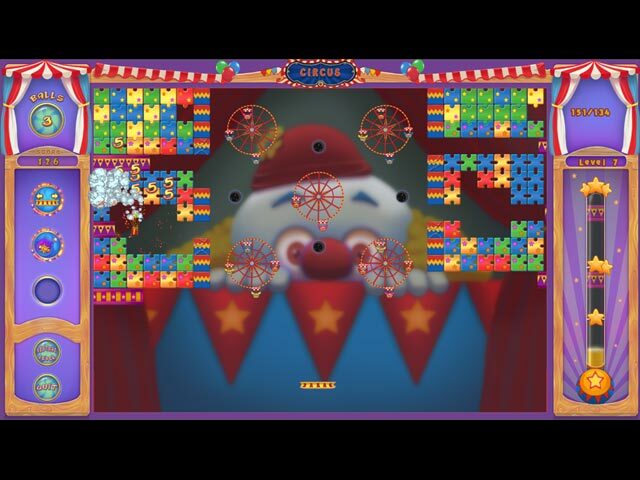 Rated 5 out of 5 by sealsbroken13 from If you remember peggle then you know this game This is peggle except with a circus and much harder, by the second level it got a lot harder. I think they expect you to know peggle because I didn't see any instructions. Just thrown right into it and you figure it out from there lucky for me I am a big peggle fan. Although I like the unicorn better, I really enjoyed the circus also. So if your a peggle fan then you will like this game if not well try peggle first it is a lot easier and explains everything. Rated 4 out of 5 by Kimmycoo from Too Short But.. I was disappointed when the end came. I just couldn't believe it. I did have a great time however with the game play. This can be a very hard game but its very addictive. 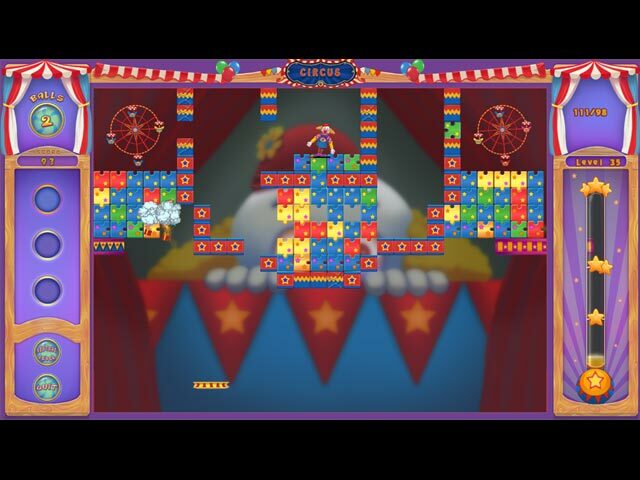 I was so glad to see a NEW brick breaker on Bigfish and I hope more are to come and perhaps a part 2 to this one?! Hope it will be longer next time. I just zoomed through these levels. I do recommend this game! Rated 2 out of 5 by campingramps from Ball of wonder is right, wonder why I played this This has to be one of the most boring games out there. The old original Break Out was more fun than this. One of the reviewers compared this to Peggle but they are as different as night and day. Peggle is fun to play. Graphics are ok but not jump out great and the colors are at least bright. I didn't play it long enough to get any power ups, if there were any, but maybe that would have added an element of fun. I don't recommend this one at all unless you're having a hard time getting to sleep then this will put you in dream land. Play the demo and decide for yourself. Have fun! Rated 2 out of 5 by Tflo from So Boring!! 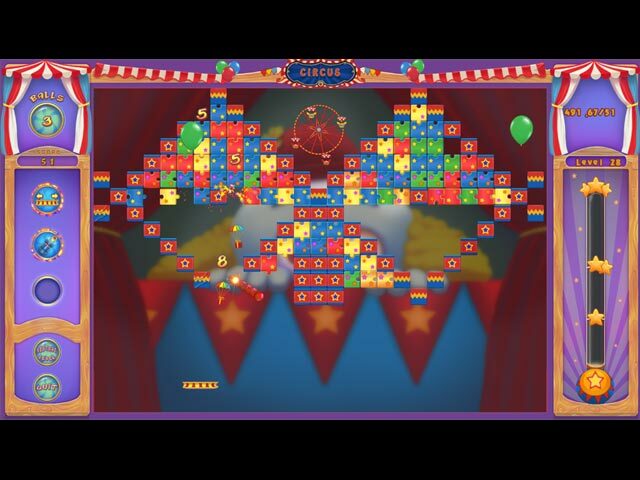 The ball moves painfully slow and the repetitive circus music is annoying after a few minutes. There is nothing at all challenging or fun about this game. These types of games should come with an age limit. This one would be for ages 8-12. Rated 2 out of 5 by pennmom36 from Old School Game That's Way Too Slow Use your paddle to hit a ball that ricochets and hits targets at the top of the board, then wait about 10 minutes for the ball to slip through one of the cracks so you can adjust your paddle to hit it up again, lather, rinse and repeat. The only exciting part is when you have to try to hit the ball back up, and catch a falling bonus package at the same time! This game is really old school and it is really fun for about 2 minutes, then it's just painstakingly slooowww, and what's up with the Christmas song and jingle bells (probably to indicate that this game is as old as Santa) There are different types of games available, Destroy all, meaning just that, you must destroy everything to win. Gather points, doesn't matter if you destroy everything as long as you gather enough points. Destroy Balloons, Ferris Wheels and clowns, self explanatory. Dark Mode, all levels have a dark mode available where you cannot see the entire board in a dimly lit version. There are 9 different Power Ups available such as obtaining a larger paddle to hit your ball. Have you ever played Pong? Well this game was made shortly after. Rated 1 out of 5 by mizztanya from boring break out remake some person compared this to peggle, but it is nothing like peggle at all. it is exactly like break out, the game that has been around for about 40 years now. boring!